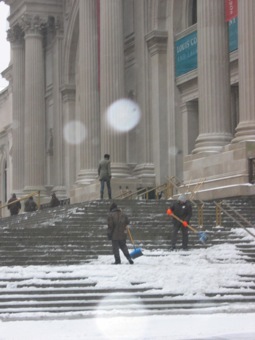 These nice men were cleaning the steps at the Met yesterday so we wouldn’t slip and break our necks. The show that my friend wanted to see was Glitter and Doom: German Portraits from the 1920s, and it was the better show. It was amazing, but horrifying. It leaves on the 19th, so get there now if you want to see it. The paintings of prostitutes were overwhelmingly, disturbingly sad. It’s such a terrible roll of the dice, what you get in your one shot at life. You’re born — and what are the odds of even being born, it must be incalculable — and you’re plopped down in midst of this one moment of history and circumstances that bring you to what was portrayed in these paintings, and then you die. That’s it. No second chances. Unless you are convinced by the research of Ian Stevenson, who I just learned died on February 8th. I wanted to interview him last year, but he was already too ill. Stevenson did research in reincarnation, and I’m not familiar with that work, but I have some stuff bookmarked and I hope to include a brief over-view in my book. Rest in peace, Dr. Stevenson. And come back soon, if that is, in fact, possible. Stevenson’s stuff is more scientific, but Carol Bowman’s book, “Past Lives of Children” is more fascinating. Thank you, I just bookmarked that too and will take a look!